I’m going to two exciting openings here in Bergen this evening. My colleague and husband Scott Rettberg is showing works with Jeremy Welsh at Rom 8 in Vaskerelven at 6 pm, and then at 8 pm, Østre: hus for lydkunst og elektronisk musikk, the new sound art gallery is opening. Scott is showing the sticker novel Implementation, that he wrote with Nick Montfort (they recently published a beautiful coffee table book of the project, btw), and Katastrofetrilogien, a video work he wrote with Rod Coover and which consists of three episodes set in or near Bergen, all dealing with an actual historic or a possible future catastrophe – the black death, a tsunami and ashes from a volcano. Three Rails Live, the final piece he is showing, is a generative narrative/video/aphoristic piece he created with Nick Montfort and Rod Coover. 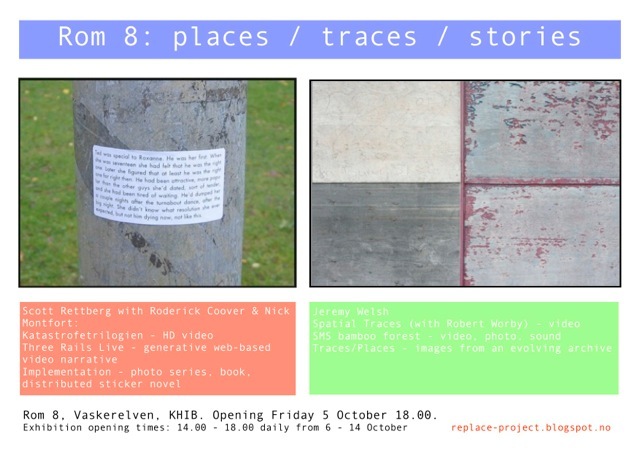 Jeremy Welsh shows Spatial Traces, a video work with sound by Robert Worby, and Places/Traces, a selection of works-in-progress from an ongoing series of investigations of place in video, photography, sound and text.